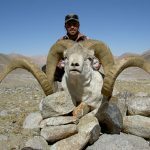 The biggest wild sheep of the world on the top of the world! The program takes place in the part of the Tajic Pamir at the altitude varying from the 3500 to the 5500 meters. The air is rare and the temperature varies from -20 to +20 degrees, depending on the season. 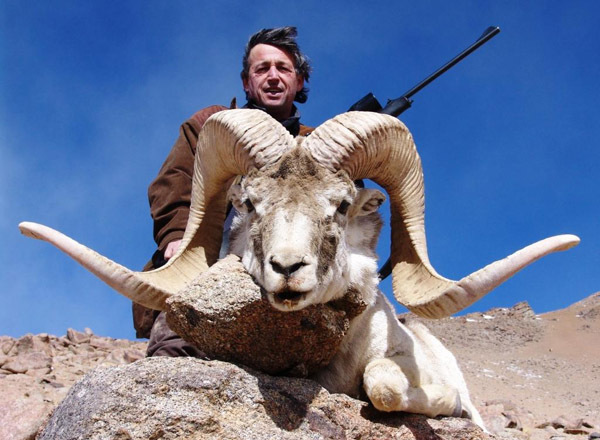 Although a perfect physical condition of the hunter is preferable, the existing great population of Marco Polo sheep and the experienced professional guides can make it possible that the people in normal physical condition can practice this hunt as well. The transfer toward the place of hunting starts from the city of Osh (Kyrghizstan), by car (8-10 hours) which helps You to get used to the altitude. The hunt that takes place in the high mountains starts in the early morning. After leaving the field by a 4WD car, the guides are looking for the sheep and after noticing them, they are deciding methods of approach considering also the physical condition of the hunter. During the last years, we had many trophies of remarkable dimensions. The measure of the trophies has varied from 120 to more than 150 cm. Transfer from the airport of Osh or Dushanbe to the place of hunt and back, professional guides, use of the 4WD car and horses during the hunt, food and lodging in equipped camp, the first preparation of the trophies. International and national air fares, hotels before and after the safari, entry visas, gun import permits, CITES for the trophies, veterinary certificate, tips, drinks and gratuities. Recommended weapon: 7mm. – 300 Weatherby Magnum. Our outfitter have 10 rifles for rent! !